We decided to go to South Dakota literally 48 hours before leaving. We’d planned two other trips to celebrate Allison’s 45th birthday, and each successively had been thwarted by poor weather. Setting out at 2am on Friday morning, we drove ~950mi arriving in the Black Hills at dinner time to crystalline blue skies and the western landscape we were looking for. Saturday morning we got on the trail relatively early with the goal being three or four summits. We managed two. We set off up Black Elk, SD’s high point, in a thick fog which steadily refused to break as the morning wore on. The hike up was cool and beautiful in a foggy sort of way. It wasn’t quiet though as there were three separate groups having reunions that involved hiking the peak. The summit was sort of a party complete with someone playing music. South Dakotans are a hardy bunch: it wasn’t a technical hike but it was a sustained 3.5mi straight up the side of the hill. Impressive that so many people wanted to celebrate a reunion by hoofing up a hill! Before setting up I called cq on my HT and the first contact of the trip was with AD7CV in Chugwater, WY an amazing 170mi away. He reported that he had a few contacts of much greater than normal range and suspected there was ducting going on. I also had a nice chat with W0FW who had heard me check into the local VHF weather net the night before. I decided to use SSB for the activation to entertain the throng that was on the summit. Conditions were terrible, though, and I managed only 5 QSOs on 20m. As I was operating, Allison was answering all the questions and keeping people from running into the antenna. I was obviously taking up way more than my fair share of the summit, so I cut it short and we packed up. We didn’t travel far down the side trail leading to the 0 activation peak before turning around: the trail was basically a creek. The Black Hills were having unprecedented rainfall which had everything lush and water going in places it didn’t normally. 6 mi r/t of creek hiking plus a bushwack summit didn’t seem very appealing. I remembered as we made our way up Little Devil’s Tower that it required some scrambling to surmount. This ended up being lots of fun. The summit was swathed in fog when we arrived so I quickly set up the KX2 after making a few of contacts on VHF. 20m had shaped up and I had a sizable pileup going. As before, there were a bunch of people on the summit and Allison did an ace job of managing them. At one point a guy who had been a radioman in the navy stopped by and expressed a bunch of interest in SOTA. Doing an activation in the middle of a throng is nerve wracking (for me anyway) but it sure is good publicity for the pursuit. As before, one band worth of time was about all one could do with all the people around. As we broke down, the clouds finally broke and we were treated to a spectacular horizon made even better by the slow unveiling act the fog did. We ate lunch and admired the view. The video has the deets on our failed attempt at doing Sylvan Mountain. Sunday morning we opted for a long non-SOTA hike in the morning and a drive up activation in the afternoon. Bear Mountain has a super cool lookout tower on the top complete with ranger fire watch guy. I suggest looking elsewhere for conversation if you visit however. He was reading a book when we climbed the tower. Allison asked what he was reading and he said “a book.” Clever, that ranger. I worked 20, 30 and 40ms on HF after getting a couple of contacts on 2m. 40m was completely dead, but I again had large pileups on 30m and 20m. I debated running SSB as well (it was a comfy summit and the wx was perfect), but the day was wearing. 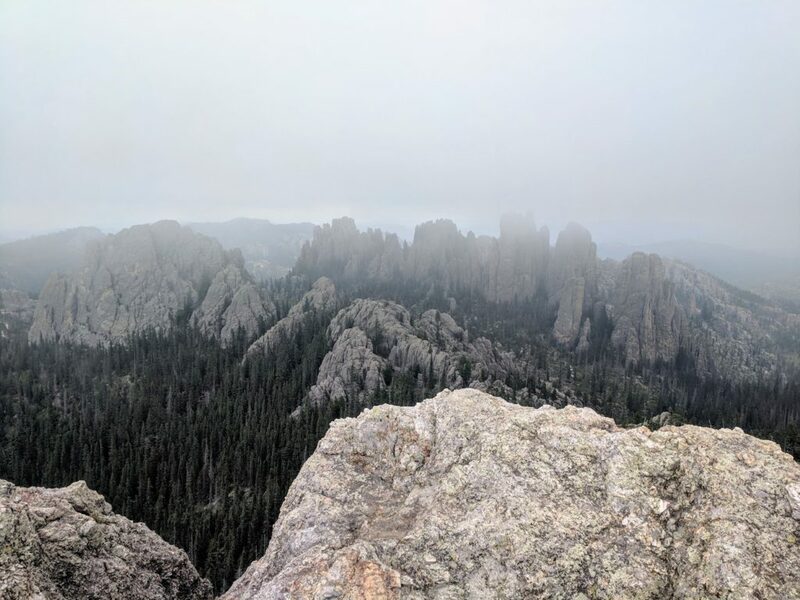 Summary: The Black Hills are a SOTA activator’s dream. There are tons of summits that range from driveups to 5th class climbing. And if you’re a climber, the rock is super nice with lots of multipitch stuff. We spent most of the drive home planning a thru-hike of the Centennial Trail we hiked a bit of Sunday. By a quick calculation there are nearly 20 SOTA refs within 1.5mi of the trai over it’s 110mi. Heaven! As always, many thanks to all you chasers for making it a fun SOTA excursion in the mountains! Thanks for the video! Love the area and been too long since our week up there. Must return! Travel safe you two.